Bombora WavePower is currently developing a novel wave energy converter (WEC) comprising an air-filled flexible membrane and an air-turbine circuit mounted on the sea-floor. Wave action causes discrete cells in the membrane to individually pump air through the turbine via non-return valves. Tank testing of a 1:15 scale physical model of this device was conducted at the Australian Maritime College (AMC) in Launceston, Tasmania. 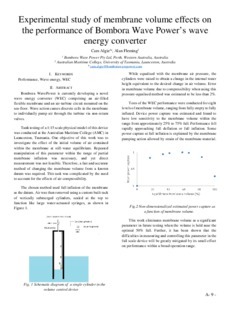 One objective of this work was to investigate the effect of the initial volume of air contained within the membrane at still-water equilibrium. Repeated manipulation of this parameter within the range of partial membrane inflation was necessary, and yet direct measurement was not feasible. Therefore, a fast and accurate method of changing the membrane volume from a known datum was required. This task was complicated by the need to account for the effects of air compressibility. The chosen method used full inflation of the membrane as the datum. Air was then removed using a custom built rack of vertically submerged cylinders, sealed at the top to function like large water-actuated syringes. While equalised with the membrane air pressure, the cylinders were raised to obtain a change in the internal water height equivalent to the desired change in air volume. Error in membrane volume due to compressibility when using this pressure-equalised method was estimated to be less than 2%. Tests of the WEC performance were conducted for eight levels of membrane volume, ranging from fully empty to fully inflated. Device power capture was estimated and found to have low sensitivity to the membrane volume within the range from approximately 25% to 75% full. Performance fell rapidly approaching full deflation or full inflation. Some power capture at full inflation is explained by the membrane pumping action allowed by strain of the membrane material. This work eliminates membrane volume as a significant parameter in future testing when the volume is held near the optimal 50% full. Further, it has been shown that the difficulties in measuring and controlling this parameter in the full scale device will be greatly mitigated by its small effect on performance within a broad operation range.